I’m not sure I need to explain the usefulness/necessity of index cards to you. I’m also not here to try and figure out what the best index cards in the world are (does Clairefontaine make any? If yes, then they’re probably the best). But WalMart does sell reasonably priced index cards under their in-house Pen+Gear brand (which is a poor name, but that’s not relevant, and I’m here to take a look at whether or not those are worth purchasing if you’re just looking for some (whichever) index cards. The dimensions of the cards themselves seem to accurately reflect the labeling, which is a good start. The paper is a bleached-white with a slightly pulpy texture that makes me think that over time or in sunlight these will become yellowed and brittle faster than your average paper products. This texture does make for a pleasant writing experience that is mostly smooth with a hint of feedback. Its ability to take ink and potential damage from eraser is about what you’d expect. Permanent markers, alcohol markers, and fountain pens will all bleed through, while even thicker fineliners (felt pens) don’t show through, and erasing doesn’t cause significant damage. If fact my only real gripe (though it is a big one), is that they are quite floppy for being “cards”. They’re flimsy, flappy, and easy to tear if handled frequently, meaning they would work poorly if one wanted to use them as say… index cards. Not only does this lack of stiffness detract from their main purpose, but it negates so many of the other things that index card were useful for in the past, like being structurally integral parts of craft projects. (Unfortunately, this can only knock the product down so far as, recently, I haven’t seen a brand of index cards that maintains the proper rigidity, so the best bet there is to make your own from card stock, I guess). If you’re looking for small cut pieces of paper for various reasons, like taking quick notes, testing swatches of ink or paint (though they may buckle), or organizing recipes that you don’t handle often, these will work just fine. And even though they won’t really work for maintaining a card-catalogue (who even has those?) they aren’t exactly anything less than I expected for the price. So another notebook competition today, huh? This time I’ll be comparing the higher end of the pocket book spectrum. 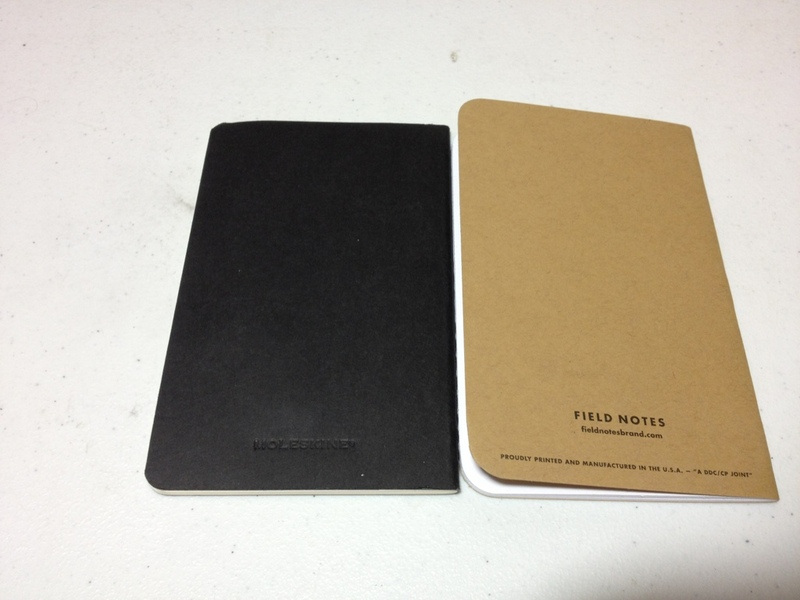 It’s time for Field Notes to go head to head with Moleskine Cahiers. Starting with the covers the Moleskine is a very heavy, single color, piece of cardboard with an imprinted logo on the back. It’s got a flap on the back that folds in and serves as the famous Moleskine pocket. This pocket is not very well secured by the glue and tears out easily, it also causes the back to be prone to creasing rather than flexing. 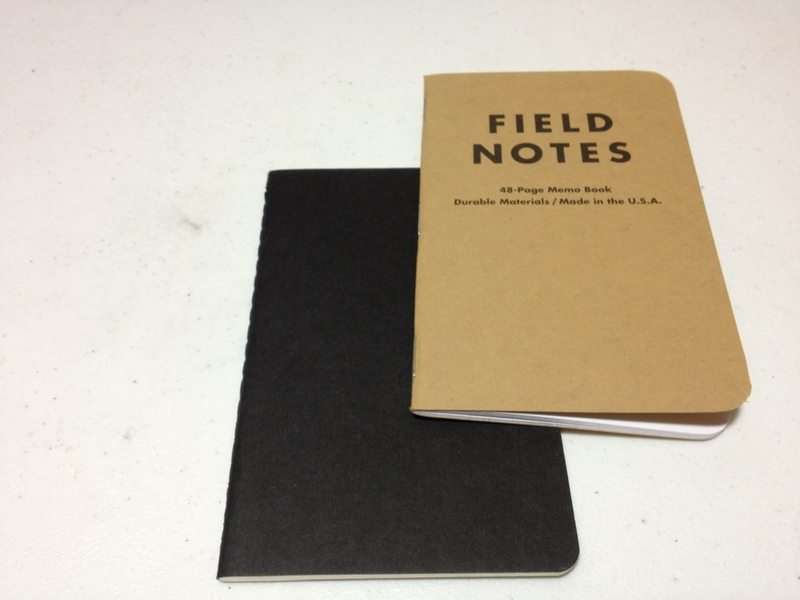 The Field Notes book has a thin “packing brown wrap” cover with a logo on the front and some identifiers. It also has a little on the back, but on the inside is where it really shines. It’s got name, coordinents, date, and return to blanks right in the front, and the back contains may useful reference items, including a list of uses, and all the materials used in the book. It’s still fairly flimsy, though, and when it bends it stays bent rather than easily popping back into place. 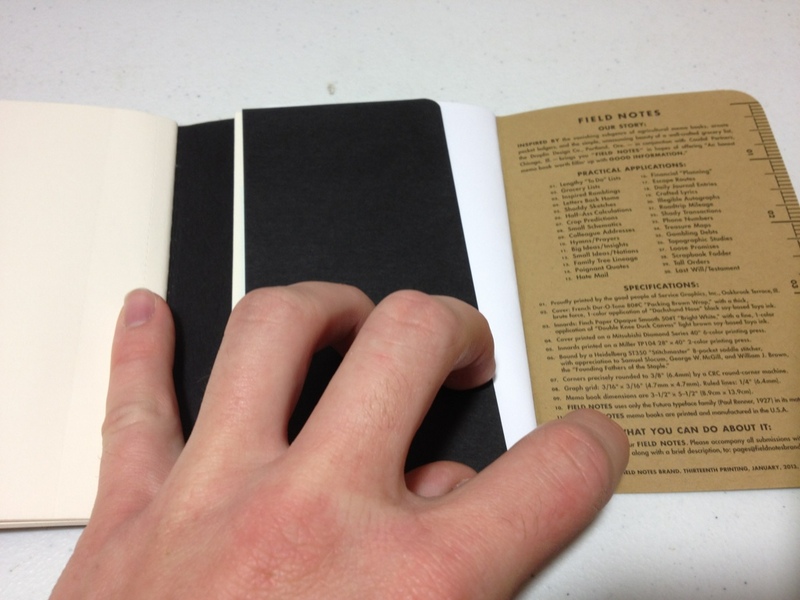 Size-wise, both books are almost identical, despite the Moleskine having 12 more sheets. 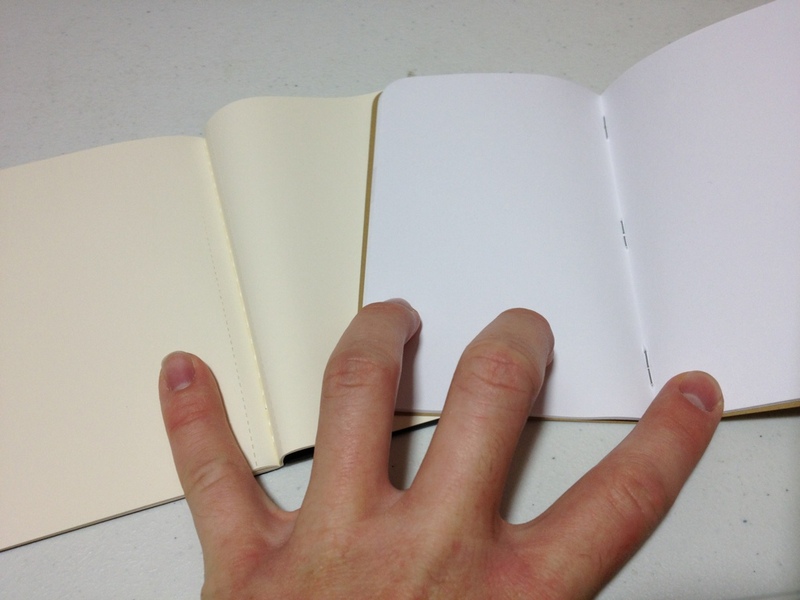 The rounding on the corners is also a bit less on the Moleskine. The paper inside the Moleskine is the standard archival quality, but fairly weak, off-white paper the comes with all Moleskines. In the Field Notes is a smooth, bright white paper. The actual type of paper is listed both on the website and in the book for easy reference. Both books come in: blank, ruled, and squared or graphed paper. But some special edition Field Notes have all sorts of different rulings. There is little variation in the ruling size wise, the only major ones being the Field Notes have a wide top margin and slightly lighter lines for the ruling. They’re brownish compared to Moleskine’s grey. One feature of the Moleskine that the Field Notes lack is that the latter half of the pages are perforated for easy removal, meaning you can tear them out without destroying the binding. Speaking of the binding, that’s where the really major difference between these books kicks in. The Field Notes are saddle stitched with three staples. The Moleskines however are stitched with 21 signatures. I believe they are also hand bound though I could be wrong on that. The Moleskine binding and cover makes it (like other Moleskines) like a rock. It is much harder to bend, but bends and creases terribly when it does so. The Field notes is a bit more lenient, bending more, but the staples provide great pivot points for bending and creasing as well. The Field Notes binding, while sturdy, can have the book come apart on it, though this rarely happens because of their limited page count. The binding on the Moleskine is much more likely to come undone itself and leave the book behind, though again this rarely happens. Really it all depends on what you want. They’re both about the same price so do you want: a better cover, more pages, perforation, and a pocket, or: better paper, better binding, and some useful information? In the end that’s what it comes done to. Also the looks a little bit. Personally I prefer the look of the Moleskine, but the quality of the Field Notes, so I use both. Try ’em and find out for yourself, it’s only like twenty dollars for three of each (at the time of writing).